When most people think of cardio, they think of long, boring jogs, or endless hours on the elliptical. I’ve got good news for you: there’s a method of cardio that takes much less time and is far superior to jogging to help you burn fat. It’s called High Intensity Interval Training (HIIT) and this article will give you the basics so you can take your body to a new fitness level. The picture to the right shows an extreme example of the different training outcomes of a marathoner (“steady state” cardio) and sprinter (high intensity interval training cardio). While these people obviously have different body types and genetics, the photo is still revealing. High Intensity Interval Training alternates between high-intensity and low-intensity exercise. 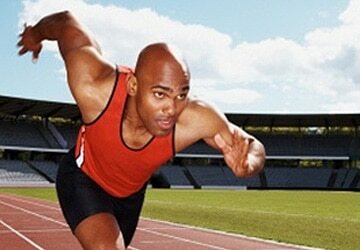 For example, sprinting for 30-seconds, then walking for 60-seconds is high intensity interval training. HIIT can be used both anaerobically in the gym with weights and aerobically with cardio. My 12-Week BuiltLean Transformation Program is based on HIIT because it’s so effective at burning fat. I do this HIIT workout all the time on a treadmill, jumping rope, or doing kettlebell swings. The duration of “work” is 30 seconds, and my “rest” is 60 seconds. The work/rest ratio in this case is 30/60, or 1 to 2. I shoot for 5-10 cycles, depending on the type of cardio I’m doing and if it’s right after strength training. The better shape you are in, the higher intensity you can handle and the higher the work/rest ratio. For example, well trained athletes can use a 2 to 1 work /rest ratio, so they are training hard for 30 seconds and only resting for 15 seconds. That’s tough! Also, in terms of fat, can you please provide a comparison (i.e For a 175lb male, 20 mins of HIIT is equivalent of X minutes on a treadmill or X minutes on a an ellyptical)? Great points. Personally, I think that HIT is much more rewarding and beneficial. I hate long jobs! The faster I can get done and the faster my heart rate the better. Thanks for the workout, I am going to try it out. I agree with most everything in this blog entry, especially about using HIIT to train as opposed to steady state cardio. However, I think your images used to present the idea are misleading. The gentleman you used for your marathoner is of different descent than the gentlemen used to illustrate a sprinter. Different groups have naturally occurring different body types and frame sizes. In addition, the man used to illustrate a marathoner is significantly older than the man used to illustrate the sprinter. Muscle mass (as well as the ability to put on muscle mass) decreases with age, and the roughly 20 years between these two men are certainly enough to make a difference. Ultimately, even though there is not doubt intervals are better than steady state, you picked images which would show the most contrast between a marathoner and a sprinter, which isn’t necessarily accurate. I understand your point. I do believe, however, that most track athletes, regardless of their descent have muscular, lean, and balanced bodies. I think you make good points about the age differences etc., but this photo was really meant to just highlight the different training outcomes of two different modes of activity (HIIT vs. steady state). It’s obviously an extreme example and I did not intend to mislead at all, just show the extremes, which I think are accurate. One more thing to mention is when I go for a jog, I love to incorporate a little interval training into it. I don’t mean to say steady state is awful. Anything that can get people to move around is great. HIIT happens to be more efficient at burning fat. I don’t have data to compare the calorie burn of HIIT vs. Cardio. I have come across it before, but it’s dependent on the type of HIIT vs. the speed of steady state cardio. Also, I want to emphasize HIIT is not just about burning calories. Too many people focus on calorie burn and not the quality of the exercise. Even if 15 minutes of HIIT burned less calories than 30 minutes of jogging, it can still be far superior to help you lose fat because of hormonal changes in your body. Thank you for this article, I should try this in the gym machines. Thanks for the great post. I do have a question though that has been on my mind for a while and it will be nice if anyone can also contribute to the answer. So assuming you weigh 175 pounds (80kg) and you jog for 30 minutes, which is around 7 METs, you are burning about 300 calories. Now I would have to put HIIT at 12.5 MET including the rest periods because it’s just so intense. Also, I have to add on 10% because of the afterburn effect. You then get about 15 minutes of HIIT equal to 30 minutes of jogging. This is really a ball park estimate and these calculations are pretty darn complicated for reasons that would take me a while to discuss, but that’s a decent estimate. I also want to emphasize in my opinion, HIIT is not about calorie burn, but about increasing your aerobic capacity substantially and improving your hormonal response. I just had a very hard leg strength training workout yesterday that I would have never been able to do if I didn’t do HIIT. I feel like with jogging, I don’t get that fire in my lungs that’s forcing my body to get in better shape much faster. You don’t have to do HIIT every day, just once a week can yield significant benefits. Thanks for the answer. Yesterday was my first day of HIIT and it was tough. In total, I was only able to do 5 mins of jogging and 2.5 mins of 100% pure sprinting. When it comes to just jogging, I’m able to go for 40 mins and thats under very hot weather because at the moment I live in Kuwait. The temp here at night could reach upto 50 C on an average day during summer. I guess that shows how tough and hard HIIT is and as we all know, no pain no gain. Thanks again for making me aware of this sort of excercise. 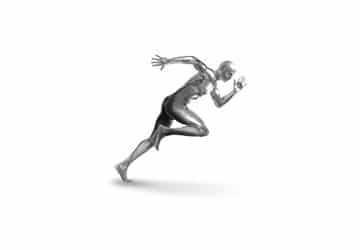 Sprinters are mainly anaerobic and they have a lot more fast twitch muscle and their explosive speed depends on how much anaerobic power they can produce in a short amount of time. Bigger is better. Endurance events are aerobic in nature which requires high VO2Max numbers and superb oxygen delivery to the muscles. It relies on slow twitch muscles and the less weight the athlete has to carry the better off they are. Their speed is Oxygen limited not strength limited hence the leaner body build up. But to say that HIIT works for your benefit so you won’t end up looking like the guy on the left is just stupid. I’d also add that elite endurance athletes do a lot more interval training than the average gym rat can ever imagine to do. Now, I’m not an elite endurance athlete my any means but I wouldn’t consider a 20 minute workout intensive. If I do intervals it’s at least 16 repeats of 200, 10 repeats of 400 or 6 repeats of 800 meter sprints at various speeds (the longer the interval the slower the speed). I also start with a good 2 mile warm-up and another 2 mile cooldown phase. So when it’s all said and done I probably ran 6-10 miles for the day. I don’t see your average gym rat running that long ever let alone running it at the intensities I run it at. Hi Greg, I thought (my mistake) it was obvious the picture was just an extreme example of both training outcomes and genetics. Frankly, I feel like you are putting words in my mouth and twisting the meaning of this article, but I will reread it to make sure I am not misleading anyone. I’m very familiar with different body types, fast twitch vs. slow twitch muscle fibers etc. that you refer to. The reality is that mesomorph types of builds can become “skinny” with certain diet/training regimens and ectomorphs can be musclular. By including the picture, I was to simply trying to show the extreme example of training outcomes, which I think is accurate. In your comments, you seem to be creating this endurance vs. hiit, bad vs. good comparison, then comparing HIIT to gym rats. There’s nothing wrong with long jogs and endurance training. I know several elite endurance athletes, many of whom follow this blog and they didn’t have any issue with this article. In fact, they liked it. I believe from a time and fat loss perspective, HIIT is superior to steady state jogging. No doubt about it. Regarding interval training, the research study you presented uses an ergometer as the training modality. So we’re comparing apples to oranges. For an elliptical, or ergometer, I agree the stimulus should be increased for a longer time period. I’ve got an awesome article coming up with my buddy who has an exceptional build (one of the best I’ve ever seen) and was a former track athlete and football player at the University of Texas. What’s so amazing about him is that he’s had an office job for the last 5+ years and still looks incredible. He’s going to be sharing some of his HIIT cardio workouts that are 20-30 minutes. That’s all it takes. Since Greg seems to be having a very similar issue to the one I had over two weeks ago, I’d like to reiterate (possibly more calmly) the issue with the two pictures you used. You never really state in your blog that those pictures are extreme examples. Instead, you label each picture generically as “Marathoner” and “Sprinter”, which heavily implies (whether you intended it or not) that this is the norm, instead of the extreme example. Although the extreme example you provided is TECHNICALLY accurate, it appears to be a deliberate attempt to mislead your readers. Comparing the average sprinter to the average marathoner (of similar age and ethnicity) would reveal a much more subtle difference. Quite simply, that is why science uses averages: The extreme case gives a misleading result and does not accurately reflect the reality for 99% of cases. Unless all of your readers are in this 99%, then the presentation you have given is not accurate. 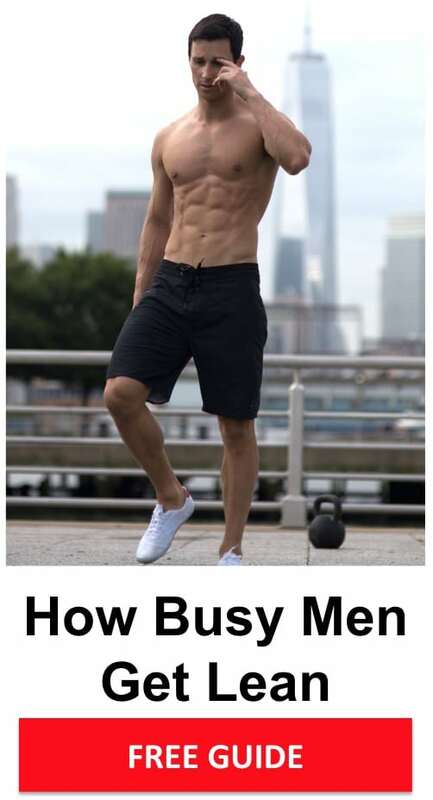 Quite frankly, I feel it’s irresponsible for an otherwise knowledgeable fitness website to use this particular tactic. It is very misleading to your readers. Once again, I am a huge fan of HIIT, but your presentation is deceiving. Thanks again for your comment. After reading it over a couple more times, I realize how people can come to a conclusion which I did not intend. I think my use of the term “body” may have thrown some people off. 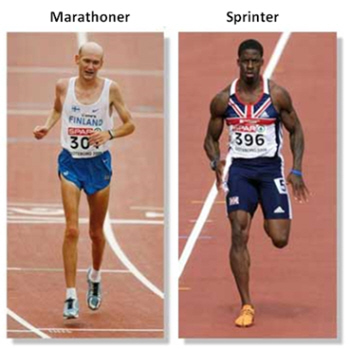 The picture to the right highlights the difference between the body of a marathoner (“steady state” cardio) and sprinter (high intensity interval training cardio). So guys, who do you want to look like? For ladies, high intensity interval training won’t make you very muscular, but does help you get leaner faster. I like your update! I commend you for taking the constructive criticism in stride, something I often find myself hard to do. I’ll be reading your blog from now on, this just shows true character! I really like your update. i’m excited about this one. learned something new for sure. now to implement! ok so i did my first set of intervals today on treadmill. 8 cycles of 30 secs work, and 60 secs rest. i kept increasing the speed for work and rest for each cycle by .1. is 1 min work and 2mins rest the goal? or perhaps 2:1? is it ok that this only took me about 20mins? should i be doing cardio for more time on days that i dont lift? I like to increase the incline to make it even harder on the intervals when running on a treadmill. I think a 1:1 work to rest ratio is about as high as you can shoot for when doing sprints and really running hard. So a 30 second rest and work, or 60 second rest and work. I go by feel, if I feel an intense burn in my lungs and my muscles are really feeling it, and I’m sweating profusely, I know I’m getting a great workout. Of course, these types of intervals are only for advanced trainees. Hope that helps. I have been trying to lose my last bit of weight to hit my target goal of 175, currently at 187. Anyways, I have been jogging around 3.5-4 miles a day on the treadmill at 5 MPH (haven’t tried faster just to make sure I can keep the pace) and I was wondering how much HIIT you would recommend to compete with that? I know you said its not all about the calories burned etc., but I don’t want to go from burning 650 calories a session to something possibly significantly less as I want to lose weight pretty quickly at this point. @ Tyler – I don’t know what your complete exercise program looks like and your nutrition, but if you are healthy enough, HIIT is an awesome workout. I have a bunch of HIIT workouts I will be adding soon. Anything from treadmill, to jump rope, to swimming. Seriously some of my best content ever. In the meantime, I would start out with maybe 5 cycles of 1 minute on, 2 minutes off (treadmill), then start decreasing the work/rest ratio (i.e. 1 minute running, 1 minute rest) and increasing the number of cycles (I wouldn’t go much above 10). FYI, I do at lest 10-11mph sprints when I do intervals, then walk, or straddle the treadmill for a minute. I would try to do HIIT 1-2x per week, then jog, or do other cross training cardio (ergomoter,swimming, jumping rope, etc.) the other days to keep it fresh and prevent your body from adapting. I would argue though that the cardio is important, but the eating and strength training will make the biggest difference in your body. Hope this is helpful! That was extremely helpful, thanks Marc. Don’t know if you remember me. I posted a question on here like a month or so ago. I just wanted to let you know that I’ve been going to the gym 3 times a week and this is what I do; 5 mph for 1 min and 10.5 mph for 30 sec. I repeat each 10 times which makes it 15 minutes in total. That is excluding the 2 min warm up and 2 minute cool down. I lost 5kg in one month and I feel great. Thanks alot for the great info. It seriously helped me alot and saved me from jogging for a long time. I feel stronger, lighter and fitter. @Wassim – How could I forget you! I’ve never met someone before from Kuwait, in person, or online. That’s great news that you have improved your body and lost 5kg in only one month with some help from interval training. Determination + a good game plan ensure you will achieve your goals. Nice work. Age 60 and need to lose about 100 lbs. Got my wake-up call a few wks ago and have been hitting the gym hard (dumbbells, weights, nautilus) and making nice progress. Also have been walking. Had my first interval treadmill walk today, 20 minutes, 3 minute at brisk pace (HR about 128), faster pace and more elevation for 1 minute (HR about 135). Max heart rate calculated between 160 and 166. Plan at this point is to build gradually, and try to get a 20 minute session in a few times a day. Comments welcome. What are the 2 (hi & lo) training zone heart rates I should be looking at? @ Bill M. – Congrats on taking control of your health. Training zones can be tricky because the better shape you achieve, the harder you have to work to get your heart rate higher. I think using your heart rate monitor to get a feel for your heart rate at various intensities, paying attention to how you feel, and slowly increasing the work/rest ratio and the intensity (speed, duration, frequency) will help you continue to improve your body. While I don’t know everything your’re doing, it sounds like you’re on the right track. It sounds like you have a positive mindset to help push you through and reach your potential. Please stop by the Builtlean.com blog and keep everyone posted with your progress! 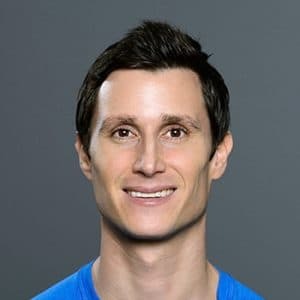 @Eduardo – If you are using a spinning bike, I would recommend increasing the amount of work times to 30 seconds to 1 minute, and the rest time to 30 seconds, to one minute. Stationary cycling is not as strenuous as sprinting for example, which calls for more “work”. I would shoot for 0.5%-1.0% loss of your weight in body fat per week, and I would recommend doing some type of strength training, even body weight is helpful. The goal is to keep your muscle and only lose fat. Thanks for your participation. I have a question. I’m a 45 year old male. 5′ 10″, 178 lbs. Five days a week, I treadmill 30 minutes a day and usually stay at a steady 4-4.5mph walking pace and cool down to 2-2.5 for the last two minutes. I’ve been reading articles regarding HIIT and wondering if its for me. I’d like to improve HDL (good cholesterol) numbers and wonder if a more rigorous workout might help. Would it be o.k. to start off by warming up for 3 minutes (3-3.5mph), sprint for 45 seconds at 8-10 mph (depending on what I can handle initially), walk again (low mph) for 2 minutes, and then repeat this, say 6x and then cool down? Would this be beneficial? Or should a guy my age stick with the steady routine I’ve used regularly? Thanks for any feedback. @Darren – I think people of any age can do HIIT training, the difference is the intensity of the work, the mode of activity, and the amount of rest. I personally don’t like running on a treadmill too much because it’s a lot of pounding on your knees and the overall volume (number of reps) is pretty high. I would recommend cross training, where you do treadmill a couple times, stationary bike, elliptical, ergo-meter, or even swimming. If you love running on the treadmill, by all means it’s fine, I just like to switch up the mode of activity to keep the body guessing and make everything more dynamic. You can start with doing 30 seconds hard on the elliptical, or stationary bike, then 1 minute resting and repeat. If that feels ok, then you can try doing it on a treadmill for 30 seconds on, and maybe 90 seconds rest and repeat. Over time, you can crank up the intensity by increasing the work and decreasing the rest. Just be sure to stretch if you are doing all this cardio and complement your cardio program with at least some strength training (2x per week for 20 minutes will go a LONG way). I think age is just a number. You can have a body that feels young and strong if you eat well and exercise effectively. I started going to the gym again about a year ago… I’d say I was starting from ground zero as I was in excellent shape and then just plain stopped when a monkey wrench was thrown into the mix and life became complicated. But for the most part I wasn’t shedding fat or gaining significant muscle. So I began using the methods (weight training, cardio and diet) I was using when I was at my most fit 5 years ago. Last week, instead of tired ol’ cardio I did a few HIIT workouts between my weight training days. Felt great! BUT…. My questions are: 1) I got on the treadmill on Tuesday and just barely got through 18 minutes (with a 4 minute warmup) and had to stop because my body was so fatigued… have others found that when they first started interval training that they hit a period of fatigue? Should I just work through it? 2) Since starting the higher intensity cardio and weight training I feel skinnier, firmer etc but gosh darn if the scale won’t budge. Should I even worry about the scale budging? It’s so flipping discouraging! 1) I got on the treadmill on Tuesday and just barely got through 18 minutes (with a 4 minute warmup) and had to stop because my body was so fatigued… have others found that when they first started interval training that they hit a period of fatigue? Should I just work through it? Answer: This doesn’t tell me how intense your HIIT workout is. Assuming you are going 1 minute on, 1 minute off, with intensity, that would mean you are doing around 5-7 cycles after your warm up, which is fine. It really depends on the intensity of the workout how long you can go. My HIIT workouts are usually around 15-20 minutes, I do 5 cycles, then I’m spent! For an example of a very hard HIIT workout to see what I mean, check out http://bit.ly/9t9658. 2) Since starting the higher intensity cardio and weight training I feel skinnier, firmer etc but gosh darn if the scale won’t budge. Should I even worry about the scale budging? It’s so flipping discouraging! Answer: It’s possible you may be losing some fat and gaining some muscle if you haven’t worked out in a while. Over time, the scale should go down if you want to lose fat. Losing fat is primarily about nutrition and eating less calories than you burn. I suggest you check out my free 10 Cut report (www.builtlean.com/email) to learn more about how to lose fat without losing muscle. Hello, I am a newbie so please keep that in mind…. I am 41, current weight is 178.8 lbs, I am on my way to a 30lb lighter me!!! I have done a few Hiit workouts on my treadmill. I want to attemt every other day but as a beginner, I am doing what I can. In between days I am still on the treadmill for 40 mins alt. between jog/run/walk. My hiit ratio is as follows 3 min warm-up at 3, then 3.3/6.6 in 3 min. to one min. intervals x 5 followed by a 5-10 minute cool-down. Total time is 30 mins. Is this not enough? I do get the burn in my chest, I am sweating profusely and on my last cycle I feel like puking. Should I maybe decrease my rest time to 2 mins for better fat burn? @Murphy – Great to hear you are using HIIT to help you lose fat and congrats on taking a positive step in your life. Losing fat is primarily about nutrition, so keep that in mind. I actually added a post about how many calories yo should eat to lose weight, which is right here: Calories to Lose Weight. It’s worth a read. Regarding the exercise, I would not recommend exercising too intensely, because you may burn yourself out. I think the goal is to workout hard, but in a way that’s sustainable. I also don’t know about your lifting program. In my mind, intervals 2-3x times per week combined with weight lifting and great nutrition is a recipe for success. The 1:3 work to rest ratio you are using is fine, I would consider over time either decreasing the work to rest ratio to 1:2, or increasing the pace of the treadmill to 7, or eventually 8, or higher. It’s all about progression when starting out, as I write about in this article: http://www.builtlean.com/2010/11/19/progression-the-best-way-to-lose-fat-and-build-muscle/. Best of luck. I forgot to mention i do hiit at a 5% incline. Hi Marc, great article; would like to hear your input. Im a 22 year old male, 154 lbs at 5’9.5″, athletic build, and have been weight lifting 3 times a week – a full body workout over the week of just compound lifts (including squats and lunges) to build some strength and muscle. The other 3 days, prior to HIIT, I did quite high intensity cardio on an air resistance exercise bike for about 15-20 mins, for cardio and fitness. I’ve very recently started HIIT due to being sold by the whole concept and its appeal – whole concept makes perfect sense, and especially as I’d like to increase stamina for general life and football (soccer). My session consists of a quick warmup of stetching my legs, and medium intensity on the bike for about 3 mins before I start my routine: 100% intensity sprints for 30 secs, followed by 2 mins maintenance cycling. The thing is, I can only push out not even 2 of these full on sprints, so the whole session is over in a few minutes (the bike’s resistance is set to allow a good full on sprint). After the first 2 sessions I felt sick, nauseous, all the signs of a good workout. None of that 80-90% intensity, I go full on and I enjoy it. I go to absolute failure as I want a decent workout – what concerns me slightly is that for me, I can’t even do 2 sprints. I feel like I get a great workout, but it’s just the numbers. I know and already feel that my progress will get better, but I’d appreciate your thoughts on my routine. @Jerus – I think lifting 3x a week focusing on major muscle groups and compound lifts sounds fantastic. Regarding your HIIT program, I am surprised you can only do 2 cycles. What I’m guessing is that going 100% is too much. Try going 90-95%, go very light during the rest period (like your barely biking), or even hop off the bike, then go again. My thinking is that you should be able to complete 5 cycles, and you may be burning yourself out by going 100%, then instead of recovering, maintaining a fast pace for the two minutes. By the way, I know what it’s like feeling like you are going to puke after HIIT. For an INSANE workout, you can check this out: http://www.builtlean.com/2010/09/21/advanced-interval-training-treadmill-workout/. Good luck and hope this was helpful! I’d appreciate if you’d answer my question. For the last few years, just like the article says, I’ve heard that HIIT burns more (and even the most) calories than doing some cardio exercise at low/moderate intensity level. My understanding abot it is that the bottom line is the total calories you burn in the same time of period. More calories you burn, more weight you lose. Am I right so far? Now, fat is the main energy source while doing a low/moderate cardio and that means what you lose is FAT even though you may not lose as much body weight as by doing HIIT. Please correct me if I’m mistaking. My question is, what exactly do we lose by doing HIIT if fat is NOT the main energy source? Since HIIT is high intensity workout, I’m assuming the energy is coming from somewhere else other than fat… (am I right) If I’m right, then what exactly the weight we lose come from? Muscles?? (I really hope not) Marc, I’ve been very frustrated not being able to find an answer to my own question. I’d really appreciate if you can clear it up. Thank you. @Nobuko – Thanks so much for the thoughtful question. I asked myself the same exact question a couple years ago. You are correct that you burn more fat as a percentage of total calories relative to glycogen at lower exercise intensities. BUT, you are still burning more total fat at higher exercise intensities than lower exercise intensities. -At 20% of VO2 max, approximately 60% of the energy comes from fat. -At 50% of VO2 max, only about 40% of the energy comes from fat. Yet, absolute amount of fat metabolism is 33% higher during exercise at 50% VO2 max since the total energy expenditure is 250% greater than exercising at only 20% of VO2 max. This same concept applies to even higher exercise intensities. (Source: EXRX https://www.exrx.net/Nutrition/Substrates ). Another very important point is not just calorie burn during, but AFTER exercise. In fact, some researchers like Christopher Scott believe total calorie burn from intense exercise like HIIT can be 95% greater AFTER the workout than during the workout! This is known as excess post-exercise oxygen consumption, also know as the “afterburn effect”. Bear with me because I will get into this whole topic in much more depth in the next couple months. Finally, it’s not completely accurate to say the more calories you burn the more weight you lose, because there are hormonal considerations as well like epinephrine, testosterone, growth hormone etc. I think people are obsessed with calorie burn, when the most important part of losing fat is calorie intake. You can exercise until you are blue in the face, but if you are intaking too many calories, you won’t lose any weight. In addition, I’ve seen some shocking body transformations that simply couldn’t be described in terms of calories in vs. calories out because a change in hormones played a large role. This all depends on a bunch of factors such as type of lifting, nutrition program, and importantly genetics. Hope this is helpful and not more confusing! I’m 36, five five and 120kg – a little fatty. I need to drop about 30 kg as quickly as I can. Am working on my nutrition but need help with an efficient exercise program. I have a 6 mth old so time is limited. I can commit 30 mins a day to exercise. In yr opinion, what should I do with that 30 mins? I have a treadmill at home so HIIT is an option. But times/speeds? @Rosie – Here are a few suggestions. Keep in mind these suggestions are without a more exhaustive analysis of your diet/exercise capabilities etc. Happy to go into more detail by setting up a coaching call. 1) Losing fat isn’t a sprint, it’s a marathon. So I would give yourself 1 year to lose all the weight. If you lose roughly 1lb of fat per week (a healthy pace of weight loss, 0.5-1% of your body weight), you have a good shot at losing all the fat, which I’m guessing took some time to put on, so it will take some time to get off. Set a deadline as to when you want to reach your primary goal and keep a weekly 1lb of fat loss goal with Monday morning weigh ins. 2) Complete the 20 minute circuit training workout 2-3x per week. Substitute squat, lunge, push, pull, twist with exercises that you can do and rest as much as you need. As you get in better shape, you will be able to choose harder exercises, use more weight, and use less rest in between sets. Complete 3-4 cycles of the circuit. Then complete 2-3 days of HIIT, depending on how your body feels. I really have no idea what speeds are appropriate for you, the idea is to work hard for 30-60 seconds, then rest however long you need before you can push yourself again. By the way, I would only do 2-3 days of exercise per week starting out, then ramp up to 5 days in a month, or two. Don’t want to burn yourself out. So your days could eventually look like Monday circuits, Tuesday HIIT, Wednesday Circuits, Thursday HIIT, Friday circuits all for 30 minutes. 3) Eat Less Calories Than You Burn – I highly suggest you track your calories, even for a few days: 7 Reasons to Track Your Calories. This will help you target the major issues with your diet. I had a client who cut out two things he realized he was eating that were increasing his calories (whole milk and a smoothie). In combination with exercise, he lost 30lb in a few months. At the end of the day, you need to eat less calories than you burn to lose the fat! Nutrition is absolutely key. Hope this is helpful. Best of luck and do continue to stop by BuiltLean.com for that extra motivation. I wanted to try to incorporate some HIIT into my cardio workouts. I currently jog/run 2.5 miles 3-4 times a week and strength train 3 times a week. I was thinking of replacing one of my runs with a HIIT cardio session. I have several small hills with a decent incline by my house that I could use for HIIT. My question is this: I’m 39 – am I too old for this? Also, my body fat was measured at 17%. I’d be ecstatic to get it down to like 16% or even 15%, if possible. I have a somewhat visible six-pack showing now but I realize I’d have to lean out a little more to make it “pop” even more. Can I achieve this with HIIT or am I just kidding myself at my age? I’m in good shape for my age range but I don’t want to injure myself doing an exercise meant for someone much younger. BTW, my BMI is 19.2 so I don’t have any weight issues. Help! I’m really confused about HIIT in regards to my situation. @Toni – I definitely don’t think you are too old to do hitt and it sounds like you are probably a lot stronger and fitter than most girls half your age. I don’t see any reason why that can’t continue into your 70’s. The one thing you do need to consider is the volume of your exercise regimen. Running on cement + full body workouts + hitt may be too much. Ultimately you need to listen to your body and I do recommend myofascial release which I will be writing about soon. Maybe is you do hitt, you could take lift only 2x in one week, or run only one other time to see how your body feels, the ramp it up. Again, I definitely think u can do hitt 1-2x per week, its just a matter of properly recovering so you don’t overtrain. Hope that’s helpful! I actually took your advice and did some HIIT cardio, though not uphill. I figured I’d start on a flat surface first. I sprinted for twenty seconds then walked for forty seconds on the pavement of the playground near my house. I did this for appromixately twenty minutes, going back and forth from one end of the parking lot to the other. I jogged over there which took me like five minutes so I considered that my warm-up. I was DYING by the time the session was over, drenched in sweat but feeling so proud of myself for actually doing AND completely it. I jogged back home and then stretched for a few minutes. I think I’m sold on this. Thanks for the advice. @Toni – Very cool! Happy you had a great workout. I think HIIT is one of the fastest ways to improve cardio capacity and burn fat, but it is tough! I’ve been doing hiit for over a year now and as you know, some days are tougher than others. 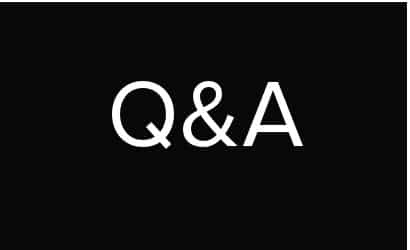 I have 2 questions actually tnat i would appreciate your help If you could give answers and i welcome any other professional help. 1) i usually do 10 intervals of 30 secs fast running and 10 of 1 min in between slow running to regain my energy so that in total i do 15 mins pf hiit. However, sometimes i find it so hard to finish it. Today when i reached the 8th round, i felt as if it was the 10th round. When this happens, does this mean that i am losing the same amount of fat even if i stop at the 8th round since i am feeling equally tired as when i do the full 10 rounds or not necessary? 2) if i fast and do hiit, do i lose more fat than when i usually do? @Wassim – Regarding (1) the difference in fat loss between doing 8 rounds, or 10 rounds should not matter very much. Some days, you will have more energy than others which can be because of sleep, nutrition, and possibly other factors like overtraining. So if you are not feeling your best, it’s totally ok to only do 8 rounds but definitely pay attention to your body. (2) That’s an interesting question that is not simple to answer, but if by fasting you mean you haven’t eaten anything for at least 12 hours, it’s not optimal to do a workout in this fasted state because your energy levels will likely be much lower, so the quality of your workout will suffer. While exercise is important to help you lose fat, focusing on nutrition will help you leverage all the hard work you put in. Nutrition makes the difference. Thanks for your answers Marc. I just need a little more detail please. So concerning the answer for 1), does this mean when I have less energy than usual and I stop on the 8th round because of sheer exhaustion , I lose fat of a similar amount as when I have better energy and I do 10 rounds? I am just trying to find out the proportion here. For 2), I am a Muslim and now we have approached the month of Ramadan where we have to fast from sunrise to sunset. If I include my sleep hours then yes, I am probably fasting more than 12 hours. However, If I just include the fasting hours AFTER I wake up in the morning, then you could say I am fasting around 8 to 9 hours before I exercise. Is that OK and would I loose more fat than usual during this fasting period of exercise? 1) I think you will lose more fat if you did 10 rounds at a high energy level then if you did 8 at a low energy level. My point is that if you can do 8 rounds with high energy, the difference between 8 and 10 rounds will not make a big difference, only a very small difference. 2) Whenever you can workout is when you can workout. Ideally, earilier in the day would be best so you would likely have more energy instead of after such a long fast. For a ton of detailed information on fasting and strength training, check out http://www.leangains.com. Hope this is helpful and just remember the nutrition has the biggest impact and @Abdul sounded like he had some good advice. I use Ramadan as a time to relax and leave heavy exercise or sprints. My advice would be that you keep active and do some light exercise like going for a 45 minute walk in the are afternoon. I agree with Marc that nutrition is key during fasting and if fat loss is your goal then nutrition will be more effective. Keep away from empty calories and processed carbs and ensure you eat smaller meals when you break your fast rather than having one big meal in the evening. Focus on your nutrition and spiritual self this month and the fat loss will take care of itself and at least you won’t be putting any weight on. When Ramadan is over, you can continue your good eating habits and introduce HIIT first thing in the morning x 4 followed by steady state cardio like walking fast paced for 20 minutes and resistance training 3 times a week in the PM. 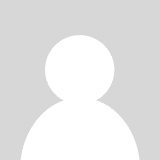 @Abdul – Thanks for sharing your thoughts! Hey mark! Can you help me check if this is a good routine to do? I have been doing it almost daily. @Red – Looks like it’s decent, but ideally you would be doing a lunge type of movement, and a twisting type of movement. If you are on Facebook, definitely check out my facebook video (http://www.facebook.com/builtlean) which goes into the 5 basic exercise movements. Also, more variety over time can be very helpful. If you do the same routine over and over again, your body will adapt, and you may develop slight overuse/muscle imbalances. Thanks alot Abdul and Marc. I just realized today that you have answered my questions a few months ago :). Never the less, thank you. I will keep that in mind for the next coming Ramadan. Hey Marc, what do you say about doing HIIT in stairs such as in a stadium? would it be less compromising for the joints than running in a flat surface? @George – HIIT in stairs such as a stadium is a classic workout that is very, very intense but offers great rewards in terms of excellent cardiovascular health and improved quickness and explosiveness. I would argue running stadiums may put less stress on your joints overall because the total amount of volume will be less than running. For example, if you run a mile, that’s thousands of repetitions/strides. Hi Marc , it has been awhile! Is there any idea/recommendation of any ‘INDOOR HIIT EXERCISES’ which I can probably do at home with ease? (Or without any equipments?) , thanks alot! Hi Marc, Can HIIT be done on the elliptical? For example, can I start out at 5-6 MPH for a minute, hit 11-12 MPH for 30 seconds, then back to 4-5 MPH and so one for 8-10 repetitions? I also wonder if this philosophy can be used with leg training too such as with squats? Go hard and fast with little to no weight for 15-20 seconds, then slow for 45-60 seconds then repeat. I’m new to this and basically with a nutritionally good diet and 30 minutes of elliptical every other day I’ve lost 11 pounds in 20 days. The last three days I’ve gained weight but I think it’s muscle because before I read your website tonight, I’ve been doing weight training on the days I don’t do cardio. I gotta make that change now. @Jake – Doing weight training on the days you are not doing cardio is totally acceptable, so alternating between cardio and strength days can work well and I’ve done it successfully in the past. Not sure where you saw on this website that states otherwise. Regarding HIIT on the elliptical, it definitely is possible and i’ve done it before. I usually go for for 1-2 minutes pretty hard then rest for 1 minute. I choose longer “work” periods because the elliptical is relatively easier than running for example. It’s a smoother motion so it’s easier to maintain a pretty intense level. 5 to 10 reps/cycles sounds good to me. Regarding your weight, your losing a lot of weight fast, I would make make sure you are not losing muscle by eating enough protein (I tend to prefer 1 gram of protein per pound of lean body mass. Thanks Marc, I must have misunderstood and will read the article again to make sure. I thought it said you can’t, very successfully, build muscle and lose weight at the same time. I assumed i may be hitting the weights to hard. My goal is to get back to where I was 10 years ago (180 lbs and just toned, not sculptured). Started this healthy lifestyle at 208.1 pounds. I completed my first HIIT workout today. I feel better today than after any workout I’ve done the last 22 days. As of today at my official weigh in I was down another 2.3 pounds. That’s 13.3 pounds in 22 days. It’s crazy how I’ve lost that much that quick. My diet is 48-56% carbs, 20-25% fats and 18-25% protein. I’ve tracked 100 % of my diet the last 22 days and the thing I notice is I can’t keep my fruit sugars under goal and it’s hard to stay under sodium goals. I meet my protein goals though according to my doc. That’s probably more than anyone wanted to read. Anyway, at a goal of net 1850 calories a day (including calories burned during workout) I’ve yet to go over. Somedays I’m under by 400 or more. But I’m not hungry an drink at least 10 cups of water a day. I say all this because I guess I just don’t understand the how to work the weights in and not hurt the weight loss. Or if doing HIIT will tone the muscle anyway. Thanks for your advice. A buddy and I are going to buy your program this week. I do hiit on my bike, boxing and sprinting, how many times will you recommend per week? 2-3, I always go max, is that ok? @Amanda – Really happy you liked the article. I think you should play with the incline and speed to get the best sense of what will work for you, because I simply don’t know your fitness level. With that said, maybe your can try a 5 incline at a 3.5 MPH pace for 1 minute, then take the pace and incline down to 0.0 and 2.0 respectively and repeat. From there, if it’s too easy, just keep on (1) raising the incline, (2) raising the speed, and (3) decreasing the rest periods. FYI, I’ve been doing 30 seconds on a 10 incline at 10 MPH, then I hope off for a minute, then do it again 5-7x. My goal is to get to 10x. First off – love the article! I just have a quick question regarding HIIT. Is it better to do HIIT 3 times a week or if possible could I do this 4-5 times a week? Would that be OK or counter productive? I, too, wanna burn fat as fast as I can. I’ve got my diet under control but I wanna max out whatever benefit I can get from this. I’m curious because I’ve heard HIIT can burn calories up to 40 hours. @Desmond – Well, you certainly can do HIIT 4-5 times per week, but it depends on a lot of factors, such as the mode, duration, volume etc. There are literally textbooks that explore the question you are asking. With that said, I would stick to 3 intense HIIT workouts per week, or less. If you are doing them correctly, your body will need time to recuperate from the metabolic/physical demands, so be sure to get plenty of sleep and drink a lot of water (both of which will increase the pace of fat loss). Is it a bad idea to eat below my BMR?. I always eat clean( about 500gram chicken breast, little bit of frozen vegies, 100g whey isolate )and eating no more than 1500cal. I cannot eat anymore and just not hungry but i can weight lift 6 days a week for 2hours, hiit 2:1 for 15 mins and feel energetic. My problem is i’m not losing body fat significantly. Do you think its because im eating way below my bmr?. Do you think its better to increase my LBM then cut? Would that be easier to reach 6-8%bf that way? @Ray – that’s a tough one…because unless you get your BMR directly measured, it’s difficult to know exactly what you are burning. I would consider upping your calorie intake to the 1800 range, 1500 sounds too low for someone of your weight and activity level. In addition, for the next few days, you can consider increasing it to 2300-2500 calories to help get your metabolism back up and running. I LOVE this article. I am 50 years old, have a small frame, but “responsive” muscles (think marathoner bones with sprinter muscles), 5’5″ and I weigh 175 lbs. (down from 191 two months ago). I work with a trainer 3X a week, and try to get some cardio in three of the other four days. I am a healthy eater (now. That was not always the case), track all my calories and water. Here’s my challenge (some of them): My body fat % is high (39%). I was small and did very little exercise for most of my life because I didn’t have to to “look good.” Needless to say, it caught up with me and I am paying for it, but I am determined. I know I’m on the right track with exercising, but I want to kick up the fat loss. If I use the trainer for strength work M, W, F, how often would you recommend HIIT on the off days? I have a few options: Elliptical, treadmill, and there is a track with a rubbery surface and bleacher stairs (44 from bottom to top) at a nearby high school. Last thing, I would like eventually to transition to a vegan diet. My body just feels better with plant-based eating. However, I’m finding that difficult right now because I’m just getting used to preparing the food, and it is difficult to get the protein in without meat, so I am eating 0%-2% Greek yogurt after workouts (18-20 g protein), and adding egg whites to my salad at dinner (10 g), plus I eat fish (usually wild salmon) once a week. Can I stay with this diet and still add HIIT? I don’t want to be impatient, but I gotta say I am tired of looking at these thighs! Again, thank you for this post. I’m bookmarking your site. @Michelle – Really happy to hear you are exercising effectively and eating better. You should discuss the HIIT question with your trainer, but I don’t see anything wrong with doing HIIT on an elliptical, or urgometer (rowing machine), or stationary bike a few times per week in addition to personal training 3x per week. That’s an agressive program, but should put too much stress on your joints (again, need to talk to your trainer because I have no idea all the exercise volume you are doing). Running on the treadmill however you may need to limit because that puts a lot more strain on your joints. As you get in better shape and lose more weight, it will be a more viable option. FYI, when switching to vegan, you may need to supplement Vitamin B-12, Calcium, Omega-3 Fatty Acids, Vitamin D, which are tough to get with a purely plant based diet. Thanks so much for such a detailed answer. I will definitely talk to my trainer about HIIT. In the meantime, I am happy to report that I take each of those supplements every day. @Linda – Thanks for the comment and very happy you are enjoying the site! Plan on adding a lot more articles and videos. Hi Marc, I started what seems like a HIIT workout not sure if I’m on the right path. On a treadmill I warm up for 5min at 3speed, run for 30s at 7spd, recover for 90s at 3sp doing 3 interval total 15-20min total 3x a week. Any suggestion? @Amanda – It sounds like you are a beginner exerciser. Warming up with an easy walk on 3 speed is fine, but after you get in better shape, you can warm up with a 5 minute jog on 6 speed. Then do your intervals at let’s say 7, or 8 speed, then hop off the treadmill and rest for 1 minute. The work to rest periods and the intensity you need to play with, it’s very hard for me to give you more specific guidance from behind a computer without evaluating you. I have an advanced article on a treadmill workout that you can modify to make it easier for you, here it is: http://www.builtlean.com/2010/09/21/advanced-interval-training-treadmill-workout/. Marc, love the site. In college I used to run 25 miles a week jogging and lift heavy weights 3x a week. Now I’ve shifted over to very intense MMA workouts and interval training. Since the switch I’ve found myself in better cardio and a bit more ripped. Question related to your “How to Get Ripped & Cut” article: I’m struggling to cut weight. I went from 196 to 190 lb. over the last month, but now I need to further cut from 190 lb. to 170 lb. to compete as a Welterweight by the end of May. I think I’m hitting a plateau. Any advise on hitting the target weight in time? Current profile: I’ve been consuming 1600-1800 calories over 3 meals per day at 8am, 12:30pm, and 7pm., 30/50/20 protein/carb/fat, and working out 3-5 times a week for 90 minute sessions of MMA. Most MMA sessions are interval training for 20 to 30 minutes, 60 minutes of medium intensity drills, and 20-30 minutes of sucking-your-breath-through-your-teeth sparring. Based on other sites focused on martial arts fitness, I believe I burn 500-1000 calories, depending on the day, per workout. @Nick – It sounds like your pace of fat loss is very reasonable. Losing 1-2lb of fat per week is the goal. Importantly, you are likely only burning fat and no muscle, which is ideal. If you want to burn even more fat, I’m hesitant for you to take your calories any lower, or changing your macronutrient ratios which may effect your performance. On the days you are not training, you can consider taking your starchy carbs down a bit and eating less calories in general. That’s the only thing I can really think of without looking at your program in detail. @Nathan – That does sound reasonable. Just make sure that you are stretching, foam rolling, and giving yourself adequate recovery. My concern is that you may be putting a lot of stress on your joints because you are a big guy. I wouldn’t do this type of training more than 2-3x per week until you decrease your weight more. You can certainly do other lower impact high intensity exercises in between your HIIT workouts. Eventually, you will be able to get to 10+ for 1 minute then rest for only 1 minute. Maybe that’s a good longer term goal. Hey, Marc, this article awakened my mind on circuit training. My body fat is just melting away. I am now circuit traning using compounds exercises 3 times a wk. I never train my arms, abs, calfs but they are growing bigger and bigger. One set, involves bench press 200lb-10 reps, then squat-200lb 10 reps, then T Bar 140Ib-10 reps, then Shoulder press-70IB (have rotor cuff injury), last 3 minutes HIIT on stationary bike. Is that ok? Ngamu – Wow, that’s a very touch circuit. It’s hard for me to give you my opinion on the circuit without a full detailed evaluation of your medical/exercise/nutrition history, your goals and expectations etc. From what I can tell, if you mean you do those 4 exercises then do 3 minutes of HIIT on the stationary bike as one circtuit, then repeat again, I would consider breaking out the cardio and doing it separately after the weight circuits. The workout should overall be more effective because your strength levels will be higher without the cardio within the circuit. Every once in a while, you can certainly include the cardio as part of the circuit to change things up. Hello Marc! I just stumbled on your website last night looking for ways to get lean and I can’t stop reading your awesome articles! I recently learned HIIT and I want to incorporate it in my workouts. The problem is, I was diagnosed with an acl tear on my right knee. I never stopped working out and focused on my upper body, but my moves are very limited. I can’t run or jump rope. I’m 5’6″, 134 lbs, age 33. I’m aiming for 145 lbs of muscle and low BMI. What would you suggest that I do? Appreciate the help. @archie – it sounds like you want to put on muscle. If you eat enough calories and create a progressive resistance program where you eat more calories over time, you should be able to gain some weight. If you do HIIT cardio, I would just be careful to limit the amount you do, and/or eat plenty of calories. Adding muscle mass takes a long time. For more info, check out this Q&A I did with Men’s Fitness on Bulking – http://www.mensfitness.com/training/pro-tips/the-fit-5-bulking-up. Hello Marc, I kinda have a special type of question for you because I am in a special kind of situation. I am ectomorph, very thin, 6.4′ tall and 170lbs. I want to gain muscle of course but I want to loose the fat I have on my back and my belly fat too. I have noticed that you can look better even if you loose 5-10 pounds and become more ripped than if you add 10lbs of mass (not only muscle of course). So I don’t know what to do, should I aim at loosing the extra fat first than go to mass gaining or opposite? Because I don’t want to end up bulked up for summer without having time to cut my extra fat that I really don’t like. What is your suggestion? Currently I weight train of course and do cardio 3x times a week on different days. And I’ve lost cca 2 pounds already. I am kinda satisfied but I also fear of looking even more thin in the future if I continue with the cardio (I do HIIT, Hight intesity and low intesity). I hate my thin figure. Please help. @Phil – Well given the summer is coming up, I would say try to get leaner without losing muscle, then after the summer start bulking up. At the end of the day, being lean is a good look, even if you are on the thinner side. A guy on the beach with a six pack debatably has the best body aesthetically no matter how big his arms are. @Phil – Check out these articles which will answer your questions – Ideal Body Fat Percentage Chart + How to Get Ripped – both of these will answer your questions of how much you “should” weigh and your concern about body weight, the finally regarding not losing muscle, download by free Get Lean Guide, which is accessible right after you enter your email. May I also add that I am around 15% BF now and I am aiming for at least 10%. How many lbs would a guy like me (168lbs now, 6’4 height) need to loose? Hey Marc, like Archie i stumbled across you website tonight looking for push up work outs. Top notch by the way! i am currently jogging (with my dog, also to burn his energy) and in the better months i cross train with my road bike with intervals and moor hiking . I am all for HIIT and agree like on my bike a 40 min ride including warm-up/cool down at HIIT is far better than a 5 hour Sunday ride. sorry to go round the houses but reading your info on HIIT how could i change from a 10k jog with the dog a few times a week ending the week with a 15-20 k jog, to HIIT? would 45 mins stroll in my running gear letting the dog run round and then light jog for a few mins ending with a few sets of sprints be good,then every ones happy, or can you suggest an alternative. To end, do you think i am maybe over-training?, even though i have a full rest week every six and a pretty sound diet? p.s whats your thoughts on triathlon training. Hi Benjamin – I’m having a lot of trouble following you. If you could specifically list exactly what you currently do in list form, then what you are considering, that would be helpful. Hello Marc! Would you do HIIT before or after weight lifting? @Thusan – After. Check out this post for more information – Should I Do Cardio Before/After Weights? Hey, Marc can you explained more in detailed how this afterburn effect works? after a intense workout (HIIT), how long do you rest so the afterburn effect can take place. And how long do we start working out again? please respond it would really help. @Albert – I have a 45 minute interview with an exercise physiologist on the subject of the afterburn effect. Keep in mind the afterburn effect is not that important relative to eating well in an effort to lose body fat. In other words, from 1 to 10 importance, eat is a 10, afterburn effect is a 2-3. With that said, the afterburn effect happens right after your workout and can last 24-48 hours depending on the intensity of the workout. I’ve been hearing a lot of hype around the afterburn effect and while conceptually it’s important, again, it’s not going to make much of a difference if you don’t have your nutrition nailed down. hello marc , I am 25years old 5’3 and 160lbs . I am a general physician(sedentarylife style) I really and badly want to get thin and lose fat . dont want to put bulky muscle and need to workout in home itself .give me some workouts schedule and workouts to get thin , thanks in advance. I would suggest searching around this site and using the search bar in the header. I also suggest for you to check out my free Get Lean Guide. It’s a great starting point for you. Keep in mind nutrition will help you lose the fat and exercise will help you keep muscle – and that’s from a purely aesthetic perspective. I am really scared of loose skin, to be honest, and would really appreciate an advice. Ivi – If you lose weight in a way that’s healthy, you will be able to decrease the impact of excess skin. In addition, you will also be able to identify if it will become a problem. It’s something to discuss with your doctor. In addition, if you are under 30 years old, it’s likely your skin elasticity can be restored over time. My trainer started me on HIIT and I lost 5% body fat in a little over 2 months (combined with weight training and a healthy diet). We do it a bit differently, I started at a 3:1 ratio and moved to a 2:1 after 5 weeks. also, on bike or elliptical, I sprint for 30 seconds but the rest time is the same. I am a woman and started at 26% body fat, 5’8″, 160 lbs. I’m now at 21% body fat, 150 lbs. Hi Marc, I did my first HIIT work out today on my Treadmill. I did 3 minutes warm up on 5mph, then I sprinted on 9 for 30 seconds and walked on 3.5 for 45 seconds, then I warmed down for 3 minutes on 3mph. I feel fine afterwards (although I only did it today so I’ll see how I feel tomorrow :P). Is this a good exercise routine to stick to for losing body fat? And how often should I do it a week? I’m 18, weigh 154lb and my height is 5’9.5. @Ben – I wish I could answer that question definitively, but without an in depth analysis, it would not be possible. With that said, I would read over the article again and pay particular attention to the concept of progression where you slowly over time make the intervals more challenging by a combination of decreasing rest and increasing volume and intensity. 8 weeks into struggling at gym but have lost 25 pounds….i am 5 foot 7 265 now and love doing the elliptical…I have done interval training for 60 min at a time with setting on 15 out of 25….the machine spaces it out to hard 1 min and no resistance a min….when I am done it says about 1000 calories burned..i am in no way “sprinting” during any of it…I would like to try HiIt but what setting should i have machine on and do i change it for the 120 seconds of slow down? Hey Mike, congrats on the weight loss so far. That’s very, very impressive. Keep up the great work. Personally, when I do interval training on a treadmill, I just change the resistance manually. FYI, all ellipticals have different settings and resistance, so it’s not possible for me to give you a specific suggestion. With that said, you can max out on a resistance that is difficult for you to handle for 60 seconds, then go lighter for 60-120 seconds. If you are doing interval training intensely, it shouldn’t last for more than 20-30 minutes MAX. It’s all about intensity and as you get in better shape, you will be able to push it harder and increase the resistance. Then after the interval training workout is done, you can do steady state training for another 30 minutes if you choose. Hey Mark. I’m a high level athlete looking for some advice. My main goal in the offseason is too get lean and add muscle. I have my workouts nailed down but I have some questions about cardio. I do sprints and heavy lifting on mondays and thursdays and want to do abs and more cardio on tuesdays and fridays. Can i trim down too a low body fat percentage by doing longer distances (20-40 minute jogs) on tuesday/friday, or should i do hiit? Just thinking if im sprinting on mondays and thursdays that i could burn fat by long distance running the other two days. I’m also wondering that if by running long distances a couple times a week will actually hamper explosiveness (train slow twitch fibers), or is this just the case if you are just running long distances and quite often. @Craig – As an athlete, the 20-40 minute jogs a couple times per week will make little difference in terms of fat loss. Losing fat comes down more to your nutrition program. I’m assuming you are already getting plenty of exercise. From a performance perspective, if you were doing like 1-2 hours of “steady state” cardio per day like jogging, that may affect explosive performance, but I’m hard pressed to believe only 20-40 minutes a couple times per week will have any impact. I have come across studies where strength/explosiveness were hampered, but again, it’s usually because of substantial endurance training. I also would reconsider your “abs” workouts. It sounds like you don’t have a professionally designed program. There is a top strength coach Eric Cressey is the real deal and he has a program you should look into – Show & Go Training. Good luck! Great article! I’ve got a question that I’d be really grateful if you could answer for me. For the past few years now I’ve been jogging 3km once or twice a week for 20 min until I heard about HIIT a few months back. So now I’ve added sprinting for 30 sec 6x and resting in between for 2-4 min. I’m going to try your variation now i.e. 60 sec and resting 120 sec for 5-10x. My question is I’ve always done my jogging/sprints on an empty stomach i.e. prior to breakfast. Sometimes I might take a protein drink just before. I want to know, however, am I burning more fat by doing my jogs/sprints on an empty stomach and then having breakfast or will I burn more fat by eating breakfast (or lunch) and then going out for a jog/sprint? @jon – We have an awesome article in our company drafts folder by Kevin Deeth that answers your question in depth. The short answer is that any difference in fat loss from working out while fasted is negligible. The most important thing is that you have high energy, so however you get the most energy, that’s what you should do. Keep in mind most of the calorie burn/fat burn comes AFTER the sprinting workout. For more on this concept of the afterburn effect, check out this article – Afterburn Effect. I wouldn’t worry about all the minutae, if you want to lose fat, worry about the total amount of calories you are eating and make a quick estimate of how many you are burning. For more, check out this article – How many calories you should eat to lose weight? So I got 24 days left, if I start today, how much weight can I actually loose ? I want to loose 6 kilos, that will be like 12 lbs I think ! How long will it take me to loose that much using this new method you’ve come out with 😀 ? I’m turning 19 btw ! Diego – I think you should shoot for MAX 2lb of fat loss per week. If you lose much more than that, it will VERY likely be water weight and muscle weight. Just had some questions. Im 24 years old, Im 5 10 and i weighed 217 in december (way higher than it should be) and I started working out and dieting, im now down to 183-187. Ive been eating 6 small meals a day, whole wheats, lean meats and beef, and other healthy foods. I havent been able to get the definition I want. I eat 1 gram of protein per pound of body weight, I lift 3 times a week, and play bball 2 times a week. Im wondering what to do next. Should i scrap the bball and do HIIT sprints instead? Do i need to eat more/less, lift more, or what would it take to shred out and get the definition I want. I dont care what the weight is. Im guessing I need to just shred out the last 10 pounds and Id be shredded at 175? What do I need to do to get rid of that extra body fat and get an ideal body fat %. @Nick – I think basketball is great and I wouldn’t sacrifice sports and social interaction for doing HIIT. Yes, taking your workouts up a notch can help you burn a few more calories and increase your metabolism a bit, but my bet is that if you nail your nutrition, you will get to where you want to be. In other words, as you get leaner, it becomes harder to lose fat. You have to eat even less calories (1800-2000 calories if you are not there already), (keep your carbs around 150 grams as long as you have energy – I find that to be a sweet spot), and eat enough protein. For a lot more detail, check out this article – How to Get Ripped & Cut. Consider tracking your nutrition with a calorie tracker/counter online for a few days, or as I mention in the article creating a nutrition spreadsheet. Combined with a structured exercise program like my BuiltLean Program (only 3 workouts per week), you can get to where you want to be. I am doing HIIT more recently after completing my first 5k run, I am doing 2.30 mins at level 9 on treadmill and then 30 sec rest at walking speed of 6.5 – completing over a 30 min period…I plan to do this 3 times a week …. do you believe these are resaonable ratios for what I am trying to acheive?? @LK – those ratios sound very tough to do for 30 minutes. If you can do that workout, then you are in VERY good shape. What you may consider is doing 9 on the treadmill, then hopping off for a minute, then going back on for another minute in a 1 to 1 ratio. Then do that for 5 to 10 rounds (10-20 minutes), whatever feels comfortable for you. As you get in better shape, you can increase the speed, or decrease the rest period, but I wouldn’t go above 10 rounds. As you are resting, you can do additional stretching, or grab some water.